This summer in the midwest has been BRUTAL. Not for the heat, but for the bugs. Temps have actually been pretty mild, but we’ve gotten a lot of rain, and therefore, its pretty much paradise for the mosquitos here. Which means my poor kiddos have been stuck inside the house, on days when they should be out running through the sprinklers and playing catch. We love to enjoy dinners on our deck during the summertime, but this summer we haven’t had a single dinner outside. It’s been a pretty sucky summer in that regard!! One of our long term projects is to build a screened in porch so we can enjoy wine and dinners and hanging out on the deck during the summer, without getting eaten alive by mosquitos. But until that plan fits into the budget, I had to come up with a make shift way to allow us some time outside to eat dinner, without becoming dinner. We like our citronella candles, but with a party of 5 trying to eat around the table, having candles set up in front of plates is just not doable. So I set out to find a solution that would allow us to keep the citronella going, but out of the way of the table. After a trip to the local thrift store and $6 spent, I had everything I needed! 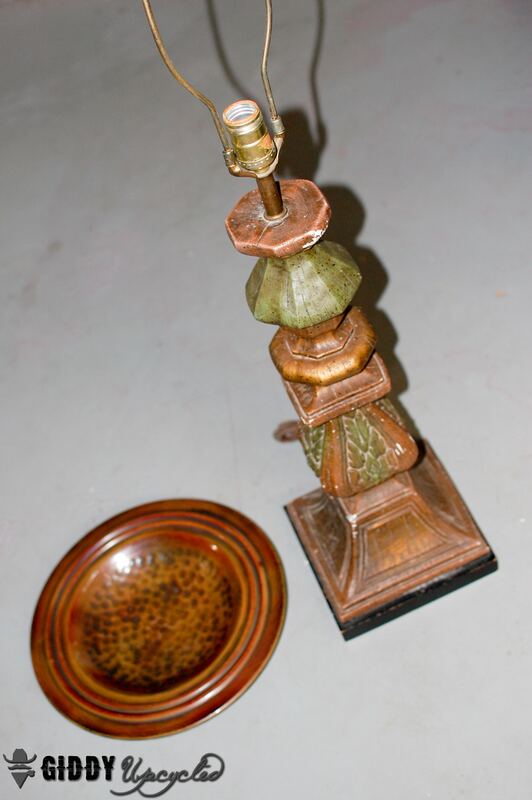 I found these… ahem… beauties at a local thrift store – a copper plate of some sort (NO clue what it would have been used for) for $.99 and an old lamp for $4.99. I was drawn to the lamp because it was REALLY heavy which would serve my purpose well. It also had decent bones, despite its super ugly coloring. 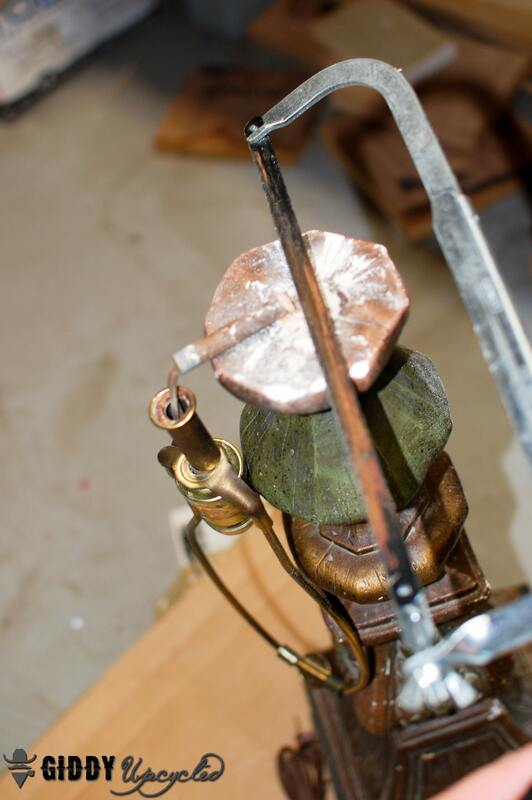 I first took my hacksaw to cut off the lamp part at the top that I wouldn’t be using. 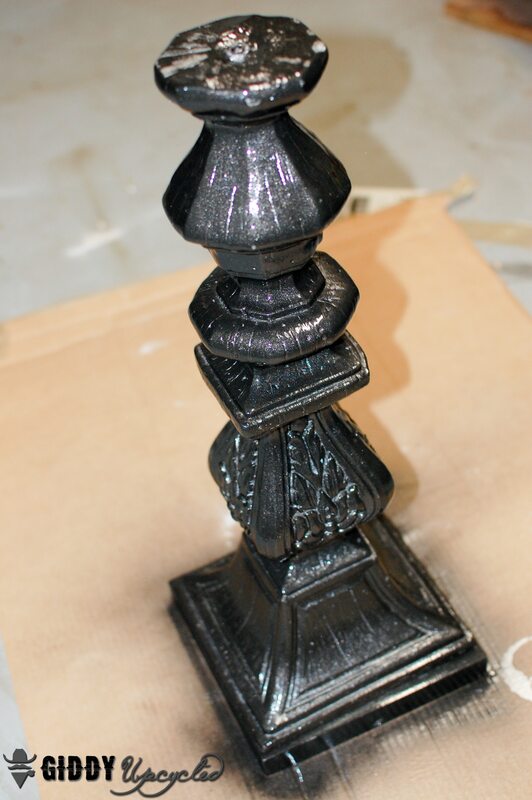 Next, the lamp base got 2 coats of Rustoleum oil rubbed bronze metallic spray paint. Now we’re on the right track! 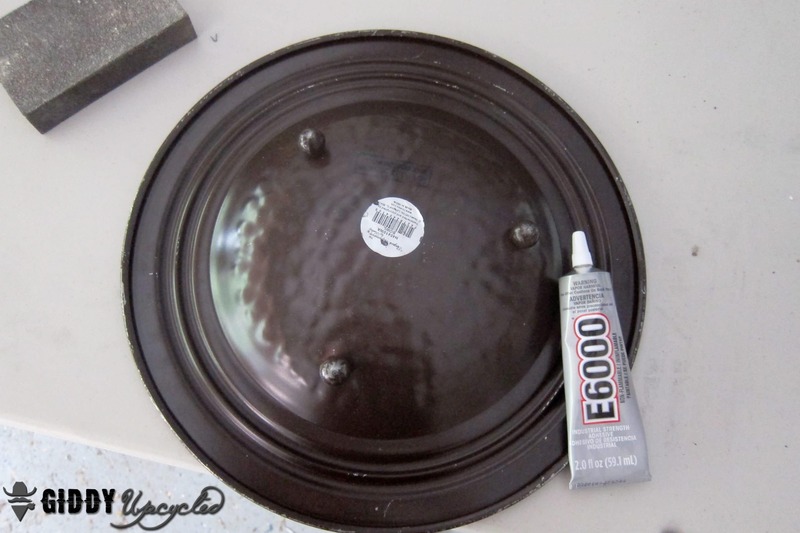 I used E6000 glue to adhere the copper plate to the top of the lamp stand. 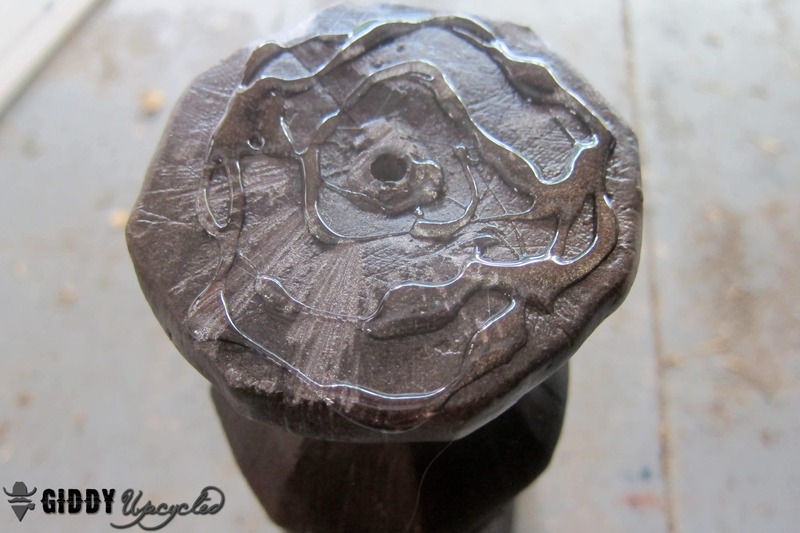 I put a couple of books on the plate to put some weight onto it – since the plate wasn’t totally flat on the bottom, I wanted to make sure it glued on in the middle and centered. I waited a full 24 hours for that to dry completely. I thought about making my own citronella candles and filling the bowl with them, but since the bowl wasn’t very deep, I figured I’d be constantly having to refill it as it wouldn’t hold very much. I ran across a large citronella candle in Lowes in sort of a rustic can, and opted to go for that. That way I can replace it as much as needed, and down the road, if we want to use the stand for something else, we can do so. 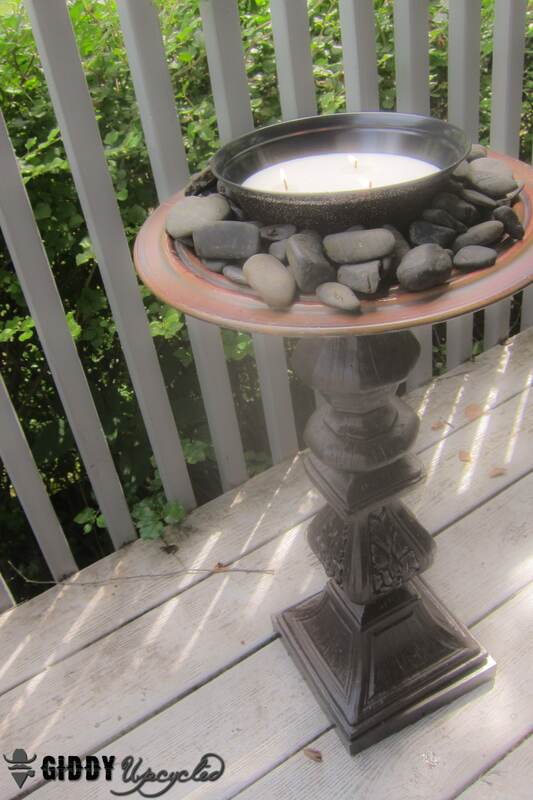 A few months back I had gotten a bunch of black river rocks from the dollar store, so I pulled those out and used them around the base of the candle to stabilize it, and give it a more rustic look. I’m pretty happy with how it turned out, and even more excited that we’ll be able to enjoy some dinners outside, before this summer is over and gone!!! 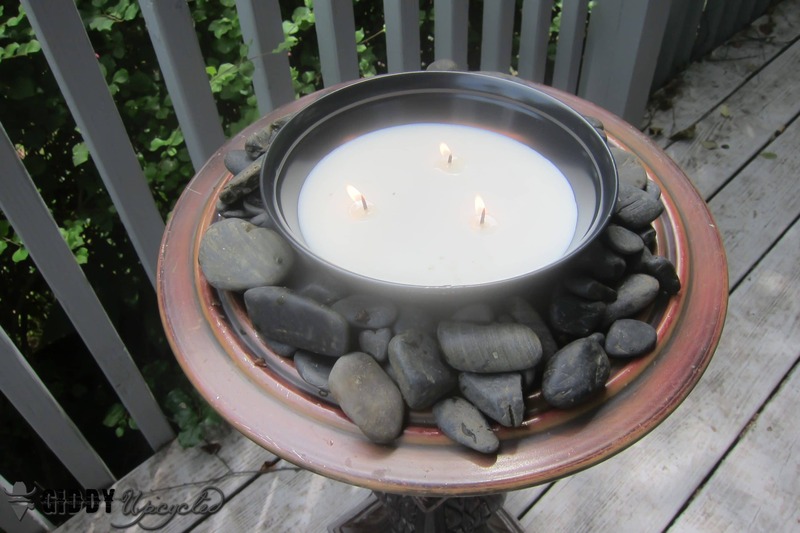 A couple of other ideas you could do… get those cool fire rocks that reflect fire and put some candles into the bowl for a more aesthetically looking fire. You could also use it as a plantar, or a bird feeder. 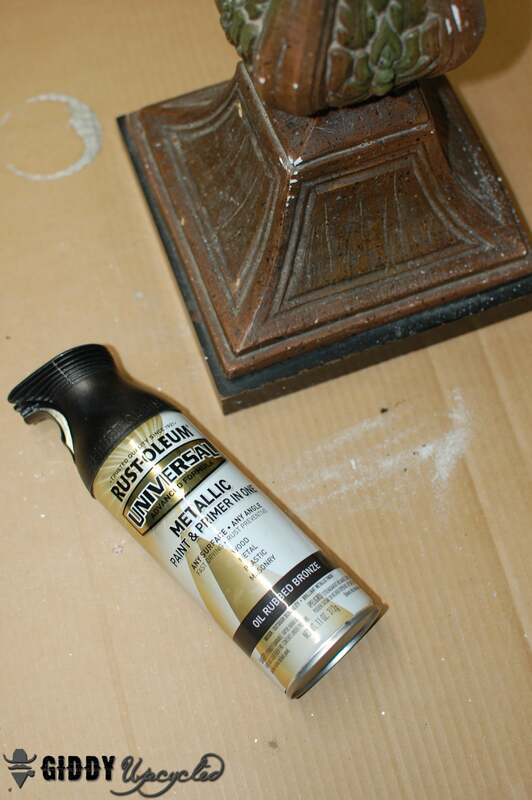 So many cool uses, from 2 ugly throw aways – thats a win! wow! This is an awesome idea. I’ll have to keep an eye out at my local goodwill next time I am shopping there for DIY stuff. This would be perfect for our deck.